Isle Of Wight Festival. Summer 1970. Grey morning, early. A huge desultory tribe in the arena - with and without weekend tickets. A ragged band on stage wanting to soundcheck. Organisers wandering up to the microphones, asking people to leave their hard-won patches, exit and come in again. Bodies curled round one another, or dancing in a vague trance. Chillums and joints drifting on the air, carrying the scent of anarchy, a hint of violence. The end of a decade. I was there, somewhere. Wrapped in a huge coat , with a felt hat pulled over my eyes. Stoned on black. Touched with an oblique sense of destiny. I set off unsteadily towards the huge stage. No one tried to stop me. I could have been armed. I climbed up and crossed the first boards. The arguments were raging all around. The festival had already gone bust. Now no one seemed to have thought of the logistics of trying to check if the countless thousands below had paid what they should. Someone painted like a Red Indian was hopping up and down shouting, 'Burn your tickets, man. Make bonfires. They'll see the smoke!' I looked over the inestimable vista and felt a surge of triumph. Up there Hendrix wrestled with his genius, beat it and apologised (he was dead not long after). Kris Kristofferson and his maudlin ballads were booed off. Tiny Tim camped insanely in the sunshine. Emerson, Lake and Palmer turned symphonic pieces into grandiose rock anthems. But here, in the silence and plain light of day, it all seemed to disappear, and a sense of something more substantial and authentic focused in a moment which stretched back through all the years before, and on, into time to come. 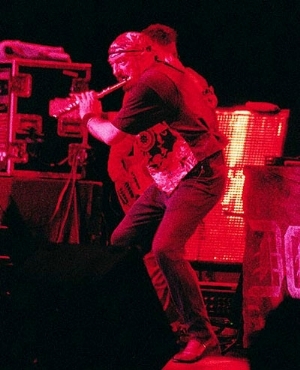 I was on stage with Jethro Tull. I've always been as bad at hailing heroes as I am at introducing songs ('This is another one...') At sixteen it was so absurd that my stammered homilies had the knack of seeming like Zen greetings. The same impulse that sent me up on stage made me pursue Khrishnamurti up a Saanen mountain path ('Is this the way...? ); pin Paul Tortelier in a corridor ('Thankyou for being...); fall off a stone wall peering into Sylvia Plath's garden at North Tawton ('You do not do...') and wordlessly present Tom Paxton with an egg cosy shaped like a rabbit. Only a spectacular groin abscess kept me from Mick Jagger. But when I came to Ian Anderson, lurking with his flute by a giant speaker, and for a second he thought I was armed with the weapon I wasn't carrying, I managed to say what I meant - 'You're why I'm here'- even if it sounded as inane. The actual Tull set was incomparable. The man himself, in tattered frock coat and leggings, twirling his flute in the lights while he pranced and postured like a demented pelican, performing an extraordinary concatenation of vocal and instrumental sounds, was mesmeric, the band behind him forceful and accomplished. Even in rock terms, they blew the big bands off the stage. (In comparison, The Who, with guitars smashing and bottles flying, seemed calculated and predictable.) But it wasn't about performance. There was a reason in their madness that set them apart. And this was what I meant when I shook the hand of the self-styled Pan then set off down again into the crowd. It was the reason that had driven me there. And it would drive me for the next twenty years - until another moment came when the same sense of time subverted and transformed would make me sure I had paid my debt, and given back what I had taken from him.